Coloring books are no longer just for kids. In fact, adult coloring books are all the rage right now. 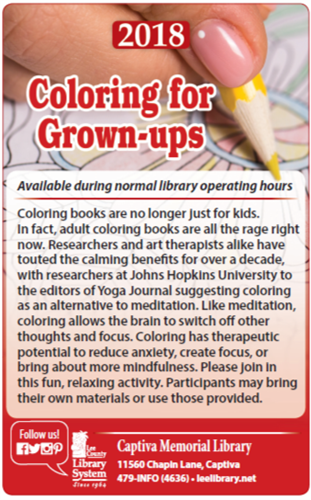 Researchers and art therapists alike have touted the calming benefits for over a decade, with researchers at Johns Hopkins University to the editors of Yoga Journal suggesting coloring as an alternative to meditation. Like meditation, coloring allows the brain to switch off other thoughts and focus. Coloring has therapeutic potential to reduce anxiety, create focus, or bring about more mindfulness. Please join in this fun, relaxing activity. Participants may bring their own materials or use those provided. HOURS: Tuesdays & Thursdays 10am-6pm; Wednesdays 12-8pm; Fridays & Saturdays 9am-5pm; closed Sundays and Mondays.